Adjacent to the Grand Union Canal and within a few minutes walk of Paddington Train station is this attractive selection of one and two bedroom short lets serviced London apartments. 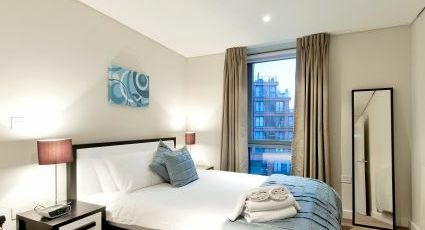 Part of a recent and very popular waterside development north of Hyde Park, Merchant Square apartments are designed to high specifications and exceptional standards: bright and spacious open plan reception rooms with modern fully fitted and functional kitchens, comfortable stylish bedrooms and smart bathrooms. These serviced short stay apartments are air-conditioned, provided with washer/dryers and dish washers and offer broadband Internet facilities. Paddington station provides a fast train link to Heathrow Airport via Heathrow Express. The adjacent Paddington Tube station is served by Circle & District, Bakerloo and Hammersmith & City lines. Many bus routes run along Praed Street and Edgware Road and connect the area with the City, Oxford Circus, Mayfair, Knightsbridge and Notting Hill Gate.